8 Day Morocco Desert tour of the great south including the the road of Kasbah visit of the old unesco Kasbah in the south of Morocco, camel ride in Merzouga desert, drive to explore the imperial cites in Fes, guided city tour of Meknes and visit the main point of interests in Rabat and Casablanca. Visit of the old Portuguese coastal cities in el jadida, mazagan and Essaouira. Departure from Marrakech to the Todgha gorge, we will cross the Tizi N’tichka Mountains (High Atlas, the highest mountain of Morocco at 2260 meters), visit to the Kasbah of Talouet, with lunch along the way. Visit in the early afternoon at the Kasbah of Aït Ben Haddou. Located 30 km from Ouarzazate, Aït Ben Haddou is an ancient UNESCO-listed Berber Kasba that has kept its original architecture and rhythms intact. Arrival in Ouarzazate with dinner and overnight in riad. 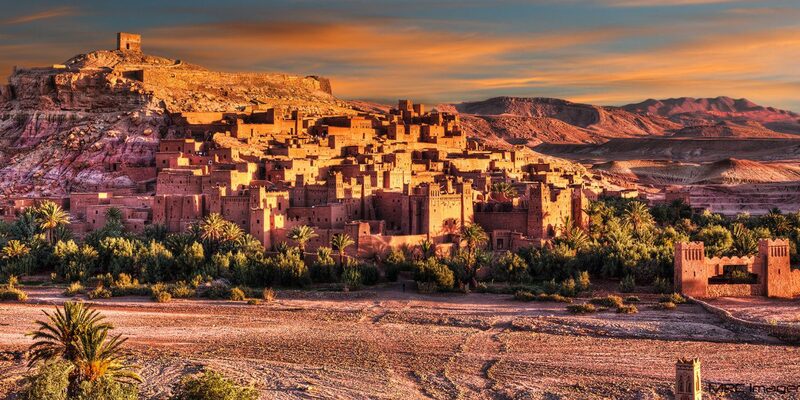 In the morning we will visit the Kasbah of Taouirt in Ouarzazate and we will leave for Skoura, where there is an ancient Kasbah (Amridil) surrounded by Berber villages still inhabited by locals in a charming oasis. Soon after we leave for the valley of roses and visit the Kasbah Tizzarouine, a crossroads between the gorges and the valley of the Dadès, also known as the “valley of a thousand kasbahs”. We will head towards the Todgha gorges passing through the Dades gorges (where by taking a short path on the unpaved road we will visit the typical caves inhabited by nomadic people). Heading west (towards Ouarzazate), we will arrive at Tinghir, dominated by an imposing kasbah. Tinghir is the ideal starting point to visit the Todra Gorges, arrival in the afternoon to the gorge dinner and overnight in a typical riad to the Todgha gorge. In the morning and after breakfast we will take a hike to the gorges (1h of gear), and we will leave for the dunes of Merzouga, stopping in an archaeological area where there are many prehistoric fossils, lunch in Rissani, a typical Berber village with a ancient Kasbah. Afternoon arrival in Merzouga and sunset with dromedary back. Dinner and overnight in Merzouga in a nomadic bivouac in Erg Chebi, evening with traditional Saharaoui music from the desert. Early wake up to witness the beautiful sunrise over the erg chebbi dunes, camel ride back to Merzouga, after breakfast we will drive in the direction of Fes. We will pass by Errachidia and we will stop at a traditional spa (Moulay Shirif) and resume the road to Fes passing through Midlet and the cedar forest inhabited by monkeys, crossing the plateau of the middle atlas characterized by beautiful Berber villages. Along the way we will visit the mountain town of Ifrane, known as “Switzerland in Morocco”. Arrival in the evening in Fes. Fes sightseeing tour, the day will be dedicated to the visit of the city of Fes, which includes the Medieval Medina, the ancient Mederse, the El Qaraouiyyin Mosque and the sumptuous Nejjarine fountain. Departure from Fes to visit Meknés (there will be a stop at the Roman Ruins of Volubilis and the sacred city of Moulay Idriss I, the burial city of the founder of Islam in Morocco, arrival in Meknes founded at the end of the 17th century by Moulay Ismail, where we will visit the historical monuments of Morocco like the Bab Mansour gate, Hari Souani and the old medina). Overnight stay in Meknés riad. Departure from Rabat to the city of Casablanca, where we will visit the Hassan II Mosque after sightseeing of Casablanca continue to El jadida. Visit the city, passing along the coast. Overnight in El Jadida, a fortified Portuguese town, a UNESCO heritage site and an elegant seaside resort. Departure from El Jadida towards Essaouira, passing through Safi, with its splendid coast of pink cliffs overlooking the sea. In the early afternoon, arrival in Essaouira, a charming little seaside town, is the ancient Portuguese city of Mogador. Visit the fish market, the medina and the beach of Sidi Kauki, known as the paradise of surfers. Dinner and overnight in riad in Essaouira. In the morning visit to the beautiful beach of Sidi Kauki, near Essaouira, surfer’s paradise, return to Marrakech, with a stop in Argana cooperative, a place of production of argan oil. Arrival in Marrakech and check in to your hotel or Riad. End Of 8 Day Morocco tour.